Malus fusca (Raf.) C.K. Schneid. The Pacific crab apple is a small deciduous tree or shrub that is found from Alaska south to California. Tall shrub or small tree, 2-8 (12) m tall; branches armed with stiff, sharp, thorn-like spur-shoots; young twigs curly-hairy; bark brown, rough, shredding, the older bark deeply fissured. Alternate, deciduous, lance- to egg-shaped, long-stalked, the blades 3-9 cm long, sharp-pointed at the tip, saw-toothed and often irregularly lobed, green and smooth or hairy above, paler and hairy below. Inflorescences flat-topped clusters of 5 to 12 long-stalked flowers on short spur-shoots; corollas white to pink, fragrant, about 2 cm across, the petals 5, egg-shaped, 8-14 mm long; calyces hairy, 5-lobed, the lobes lanceolate, bent back, 3-5 mm long, deciduous; ovaries inferior; styles usually 3, smooth; stamens about 20. Fleshy pomes (small apples), ellipsoid to egg-shaped, 1-1.5 cm long, green becoming yellow to reddish or purplish, 3- to 4-chambered; seeds 1 or 2 per chamber. Moist to wet, open forests, streambanks, upper beaches, shoreline thickets, estuary fringes, swamps and bogs in the lowland zone; common on coastal islands and adjacent mainland; N to AK and S to CA. A shade-intolerant. 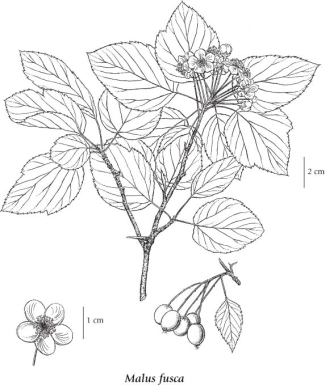 submontane to montane, Pacific North American shrub or broad­leaved tree. Occurs in cool mesothermal climates on wet to very wet. nitrogen-rich soils (Moder and Mull humus forms); its occurrence decreases with increasing elevation and continentality. Scattered in open­canopy forests on water-collecting sites; often inhabits brackish-water marshes and sites affected by ocean spray; rare on water-shedding sites. Characteristic of nutrient-rich wetlands. Malus diversifolia (Bong.) M. Roem. Malus fusca var. levipes (Nutt.) C.K. Schneid. Pyrus rivularis Dougl. ex Hook.